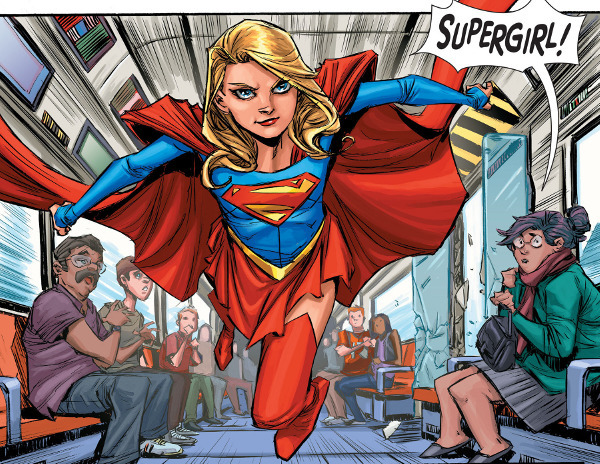 Following the events set up in Supergirl: Rebirth #1, the first issue of the new Supergirl series centers around Kara Zor-El's struggle to fit in to her life on Earth. Kara struggles against the limitations of both her new cover identity as high school student Kara Danvers and her role with the DEO who want to monitor, and control, when and where the Kryptonian teenager uses her newly-restored powers. Artist Brian Ching proves to be an interesting choice for the artist of the new series giving it a distinct look and feel. There's a bit too much classic Peter Parker moping going on her for my tastes as Kara's lack of understanding with Earth technology (far behind Kryptonian advancements) leads to struggles in the classroom. Writer Steve Orlando balances these sequences with scenes from Krypton showing us how Kara excelled in similar situations on her native world. Needing an escape eventually leads Kara to the Fortress of Solitude where the comic sets up an unexpected reunion for Kara with the re-introduction of her father as the new Cyborg-Superman. Worth a look.